Books we have published, written about very special rescue efforts and about very special dogs! New: Now Available in EBook format! The latest publication from The Dog Liberator is China’s Story – Deaf Dogs Hear with Their Hearts. 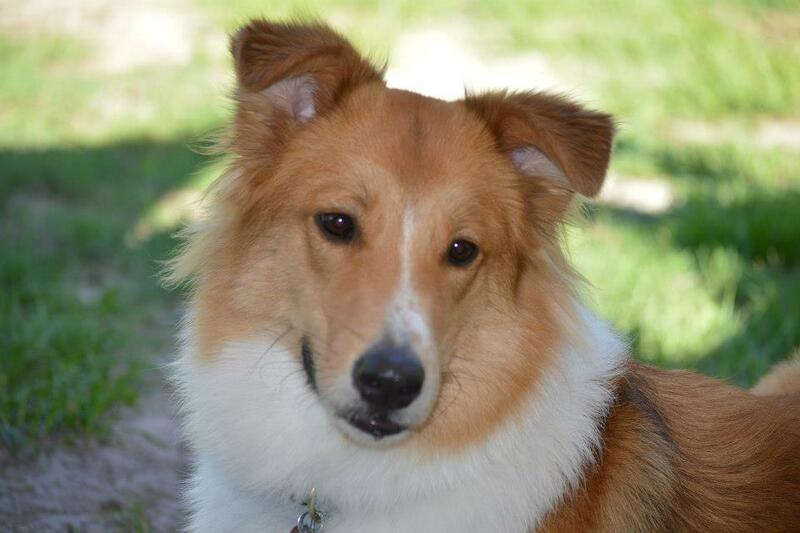 As all of our published books, many other rescued dogs are mentioned. China’s story discusses many of the shy and fearful dogs we have rehabilitated, including Nutella, and shares stories about many of the deaf dogs we have rescued, like Winter. I hope you enjoy China’s story, and I hope you share your thoughts by leaving a comment! For more information about our Deaf Dogs, visit The Chosen Ones. I get a lot of email from our followers asking for updates on our dogs. 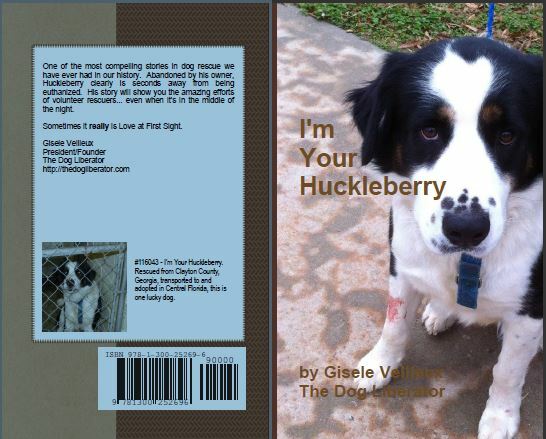 Since Huckleberry’s story was so closely followed and adored, we have decided to write his entire story and publish it! We have interviewed people, added their comments, gone back through old emails and text messages, and interviewed Huckleberry’s new family to create a complete story from beginning to present. It’s very impressive! We waited until after our reunion to publish Huck’s story, and it was worth it! His book is now available to purchase on Lulu, and will be submitted to all of the major online book stores, like Amazon, Barnes & Noble, etc. shortly! If you remember, Huckleberry was adopted right before the holidays, and I think it’s fitting that his story is available one year later! Congratulations to everyone who took part in his very special and dramatic rescue! Arthur, an inquisitive but typical elementary school boy and his four-year old sister, are thrilled when their Mom brings home a new little puppy, Penelope. It does not take long before Penelope becomes a young adult dog. Much to their surprise, Penelope shows dominant behaviors when she tries to bite both Arthur and his little sister. Thinking that they can control the situation and distance themselves from Penelope, it gets even worse. 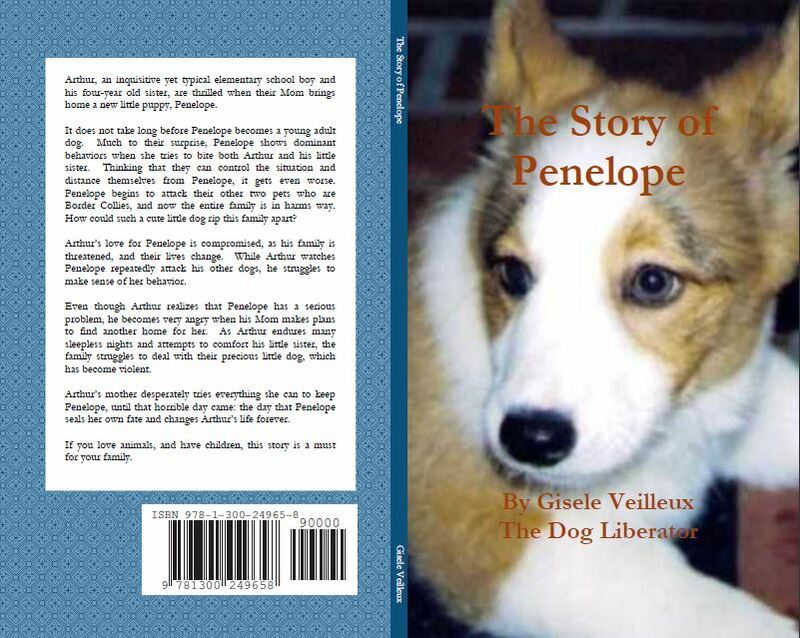 Penelope begins to attack their other two pets who are Border Collies, and now the entire family is in harms way. How could such a cute little dog rip this family apart? Arthur’s love for Penelope is compromised, as his family is threatened, and their lives change. While Arthur watches Penelope repeatedly attack his other dogs, he struggles to make sense of her behavior. Even though Arthur realizes that Penelope has a serious problem, he becomes very angry when his Mom makes plans to find another home for her. As Arthur endures many sleepless nights and attempts to comfort his little sister, the family struggles to deal with their precious little dog, which has become violent. Arthur’s mother desperately tries everything she can to keep Penelope, until that horrible day came: the day that Penelope seals her own fate and changes Arthur’s life forever. If you love animals, and have children, you must read this story. The purpose of this book is to help parents talk to their kids about the emotional upset that takes place when an animal shows aggressive and dominant behaviors toward other animals or family members. We are all optimistic when we bring a new pet into our homes, yet things don’t always work out the way we planned. Unfortunately, kids usually think it’s their fault, or they get angry with you, the parent. If your family is struggling with an aggressive pet, the story of Penelope will facilitate communication between you and your children and allow them the freedom to express and share their emotions with you. Arthur, a young storyteller, shares his situation with your children so they will not feel alone. More importantly, this book will help educate your children. The knowledge that they will gain by reading this book will empower them for when they become young adults, and future pet owners. The “What Did I Learn?” section of this book provides vital information that your family should use before you chose your next pet. Also included are websites where professionals and volunteers are prepared to help you. Younger readers will find a handy dandy Glossary filled with easy-to-understand definitions to some of the words used in this book.